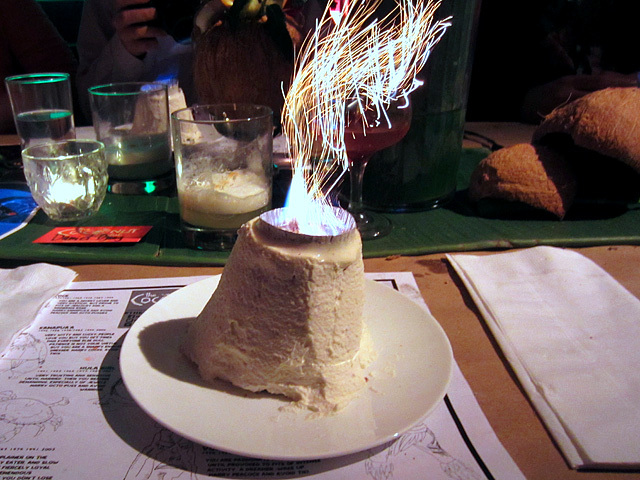 The Tiki god Volcan watches over The Coconut Club. 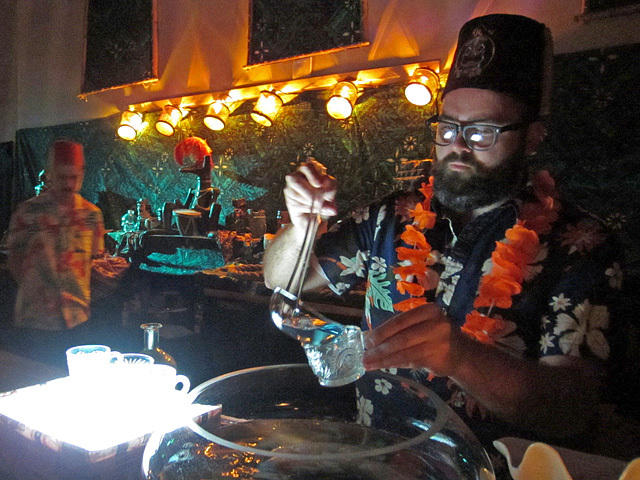 Prebble’s seductive words perfectly capture the essence of The Coconut Club, an immersive Tiki experience presented by chef Andy Windak, Nathan Hazard (These Drinks) and Elana Lepkowski (Stir and Strain). 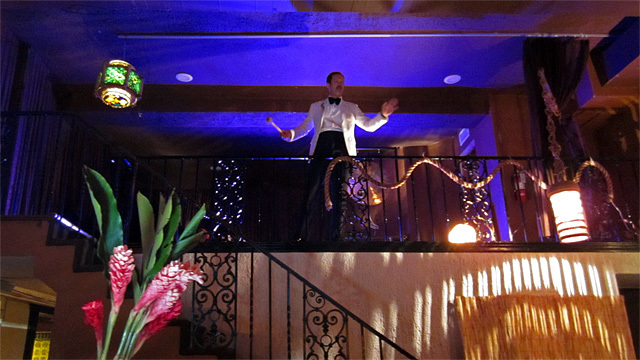 The Coconut Club recently completed a three-night run at a historic space on Wilshire Boulevard near MacArthur Park. 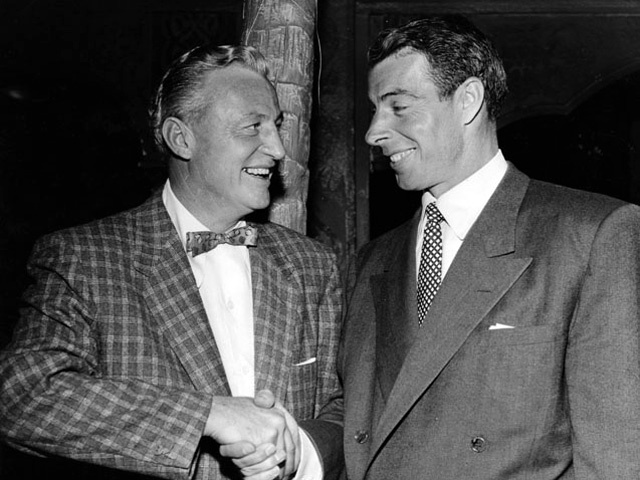 I donned my best tropical-chic threads and joined my fellow travelers as Hazard’s guest on opening night. 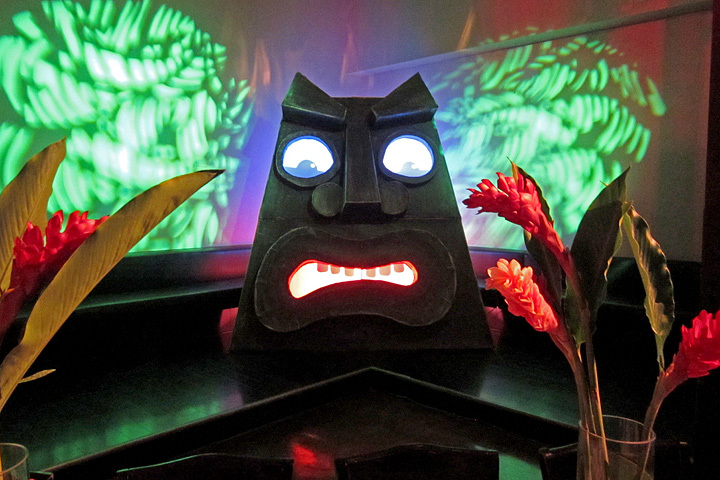 The latest iteration of the Tiki popup took place in the landmark building that housed the Hayworth Theatre and La Fonda Supper Club, a popular restaurant that featured a mariachi dinner show before it closed in 2014. According to the Los Angeles Conservancy, the two-story building is “a prime example of the Spanish Churrigueresque style practiced in the mid-1920s by the firm of Morgan, Walls and Clements and perfected by its chief designer, Stiles O. Clements.” The architectural firm worked on other landmark L.A. theatres, such as the Mayan, the El Capitan and the Wiltern. 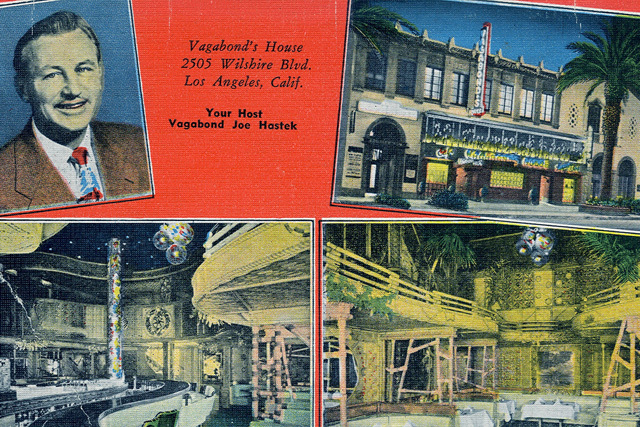 Before La Fonda, the restaurant space was known as Vagabond’s House, the third Polynesian supper club opened by restaurateur Joe Chastek. Like his earlier venues, Zamboanga and the Tradewinds, Vagabond’s House was a popular destination for celebrities and sports stars. 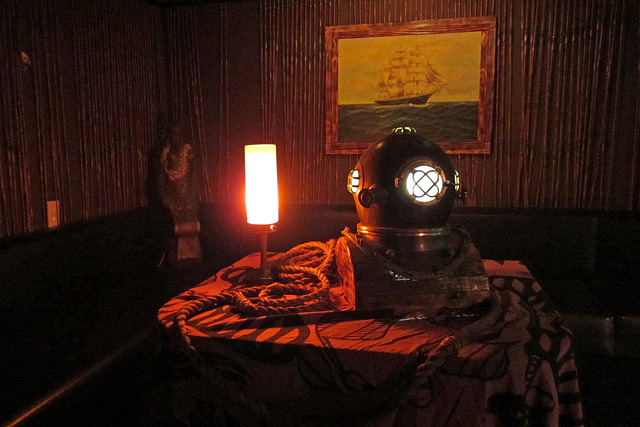 Decades after Vagabond’s House closed, The Coconut Club resurrected the spirit of Chastek’s South Seas hotspot with a four-hour multimedia extravaganza. The journey began as soon we stepped through the doorway and into another time and place. 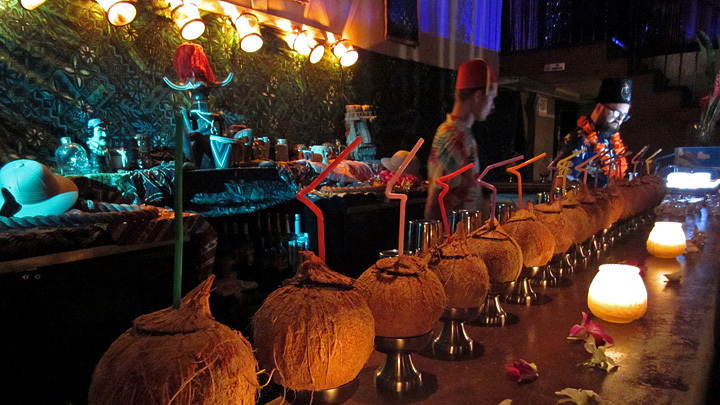 A long bar was lined with two dozen coconut cocktails, while the back wall was decorated with a variety of exotic paraphernalia. 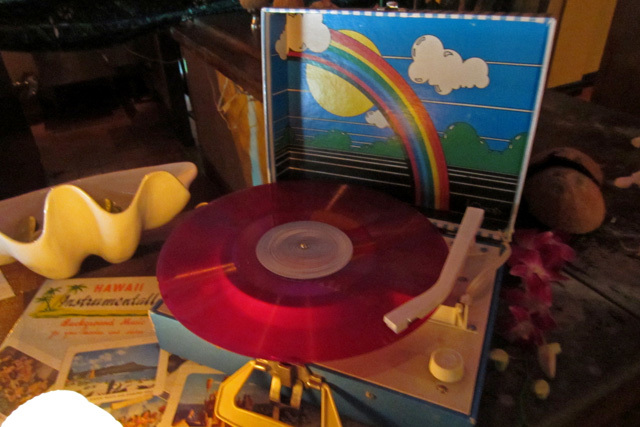 A vintage record player sets the mood with Hawaiian slack key guitar instrumentals. 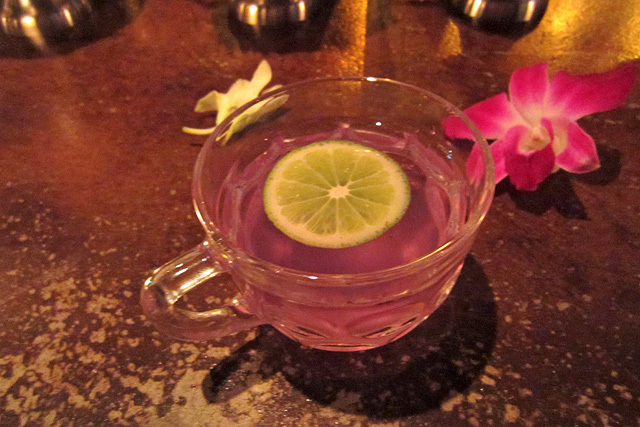 Our welcome cocktail was the Casual Colonialism: Martin Miller’s Gin, clove-peppercorn syrup, lime juice, Velvet Falernum, Wild Hibiscus Co. Butterfly Pea tea, Jamaican bitters, topped with freshly shaved nutmeg. Presented on a light box to highlight its color change, the Casual Colonialism set the evening’s magical tone. As Hazard ladled the punch, guests noshed on garlic fried peanuts, Thai basil cashews, yam chips, yucca chips and rice puffs. Hazard describes himself as “an unabashed Tiki nut, barfly and cocktail concierge.” Imbibers can find his cocktail recipes in collections like The Way We Ate (Simon & Schuster) and Savory Cocktails (Ulysses Press). He’s also the co-host of The Table Set podcast, and was named Chief Brunch Officer of Los Angeles by Aperol to serve as brand steward. 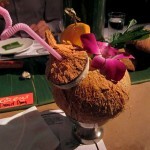 In addition to The Coconut Club, Hazard creates custom cocktails for clients and staffs private events. 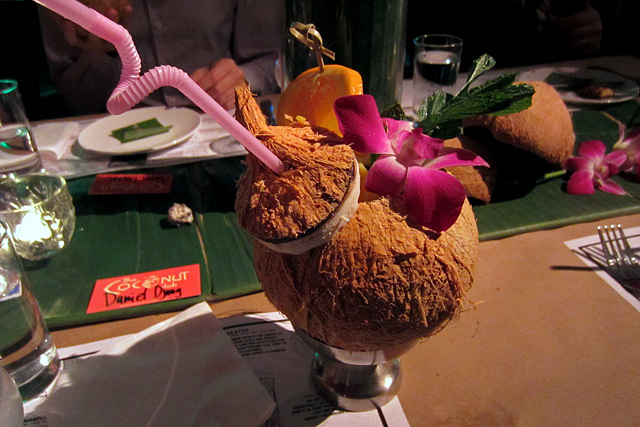 During The Coconut Club’s collaborative process, Windak creates the food menu, and Hazard and Lepkowski test cocktails both together and separately. “We do occasionally all taste together,” says Hazard. “Before each run, Elana and I discuss new [cocktail] ideas, recipe test separately, then do a tasting together to decide on the final menu. 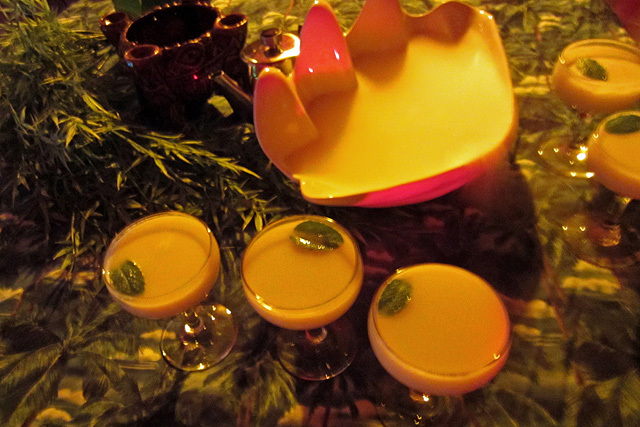 Some cocktails such as Vagabond’s Ghost are purely collaborative and came from our combined R&D play.” Hazard notes The Coconut Club’s food and drink menus change constantly – every event is a bit different and therefore unique. 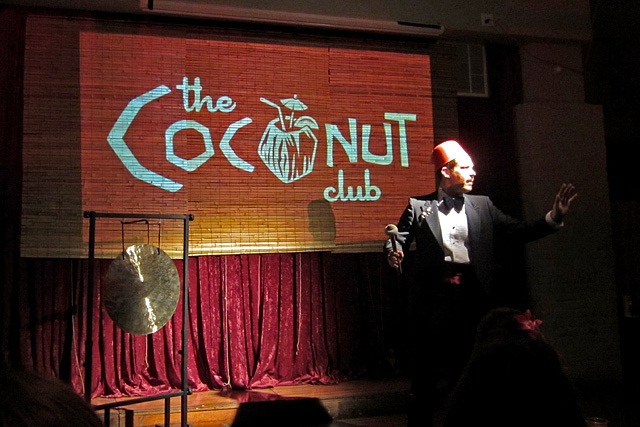 At the sound of the gong, we were welcomed to The Coconut Club with a flourish by the emcee, Darren Herczeg. Our dapper host invited us to toast with a Pineapple Skewer: fresh pineapple, dried pineapple, “pine-apple” and a Haribo Gold-Bear. We were ushered upstairs and participated in a seance conducted by Herczeg, who then led us to a table and our next cocktail, Vagabond’s Ghost: white rum, coconut milk, lime and pineapple juices, creme de peche, Cava, Herbsaint mist. Herczeg brings an entirely different set of influences to his role as emcee, with “a decidedly kitschy approach in film and music as seen in his audio-visual collages throughout the event. 1980s Hawaiian action flicks, Kokomo, Fantasy Island, and David Bowie play alongside our twists on classic Tiki cocktails and reimagined pu pus, creating something altogether new.” Herczeg’s presence is vital – he remains in character with tongue planted firmly in cheek as he presents each course with a gong and an over-the-top intro. 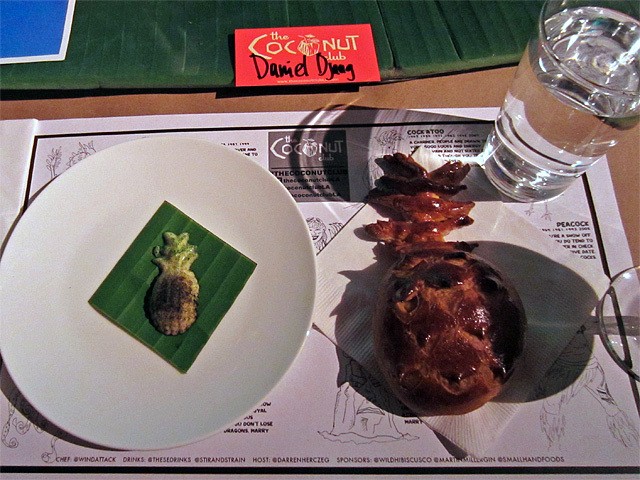 After we were seated, the multi-course dinner began with a pineapple-shaped sweet roll with pineapple butter. 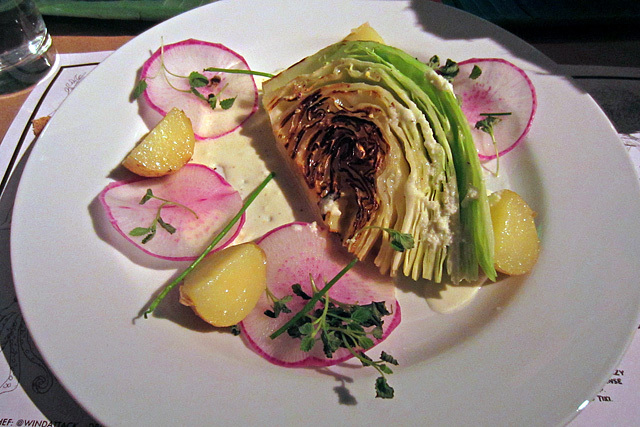 The salad course featured the Wonder Wedge: crunchy grilled cabbage, coconut-buttermilk dressing, smoked potatoes, purple daikon, capers and mint. The Wonder Wedge was paired with the signature Coconut Club Cocktail, made with a house rum blend, citrus juices, spiced syrup, Small Hand Foods orgeat, apricot brandy, Becherovka and Angostura bitters. 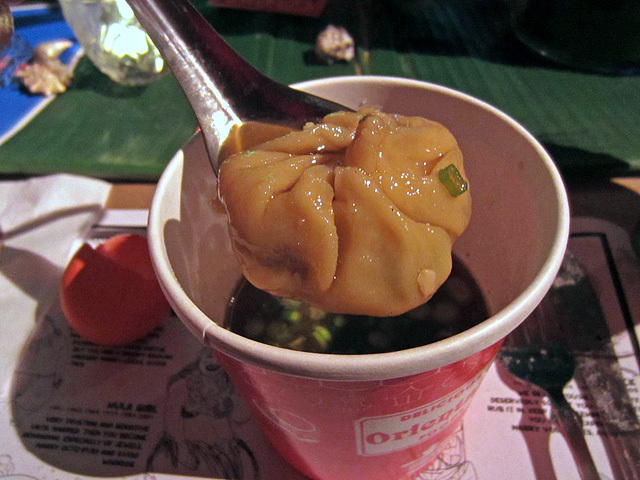 The next course was Egg Drop Soup, served piping hot in a Chinese takeout carton with a smoked shiitake tofu dumpling, scallion, and a “phoenix egg” that we were instructed to crack open into the savory charred-onion broth. 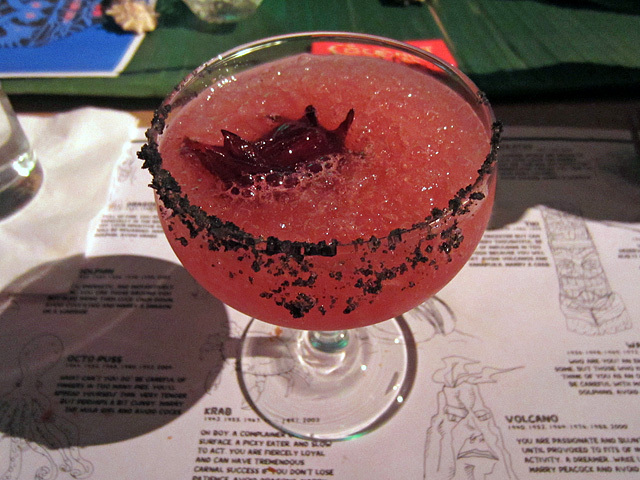 The outstanding LAVA cocktail was made with mezcal, Campari, grapefruit and lime juices, cinnamon, Wild Hibiscus syrup, black lava salt and a hibiscus blossom. 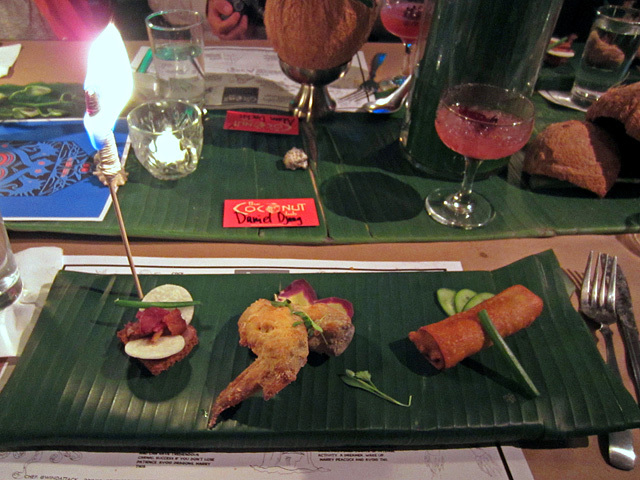 The dimly-lit dining room became bright as day when we were served the fiery Personal Pu Pu Platter: Rumaki Toast (brioche, chicken liver pate, jicama, bacon), coconut chicken wing and duck confit spring roll. 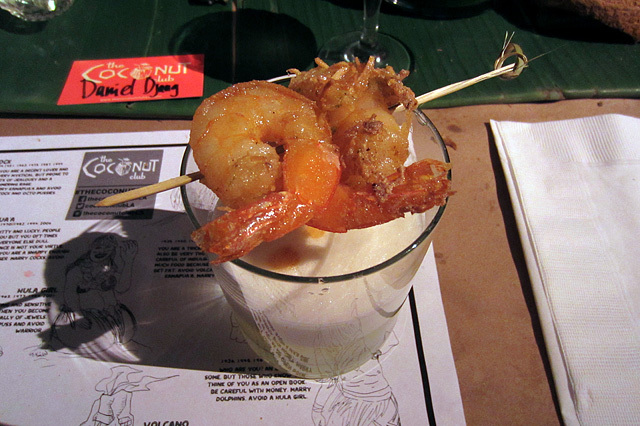 The classic Shrimp Cocktail was reimagined as the Piscolada: pineapple-infused pisco, lime juice, coconut-lemongrass syrup, egg white, Amargo Chuncho bitters, garnished with a skewer of coconut shrimp. 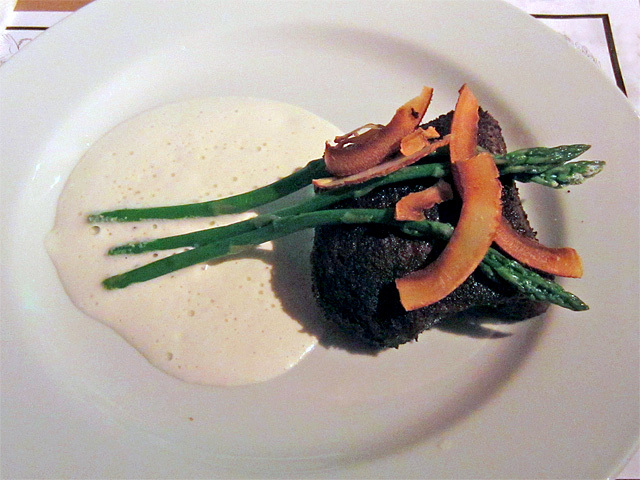 “Meat and Potatoes” showcased coffee-rubbed prime flatiron steak (a perfect medium rare), macadamia sauce, poached asparagus and toasted coconut. 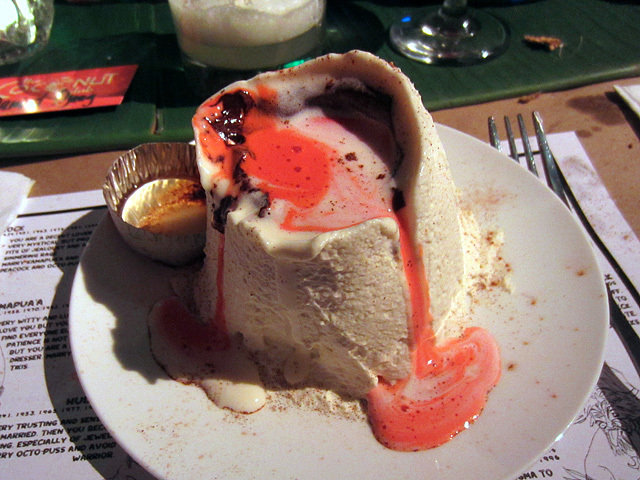 The epic meal concluded with the decadent VOLCANO Cake: chocolate-coconut-banana cake, dark chocolate, fresh whipped cream and cinnamon. 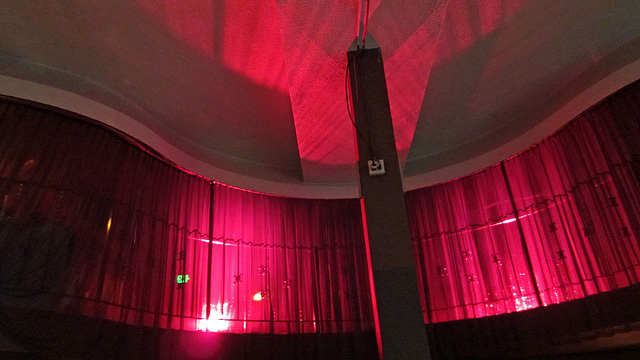 The Coconut Club has grown considerably since their “proto-event” took place in February 2014 at the SEED Center, The Great Company‘s creative space in the Arts District. As dinner approached the final gong, someone at our table remarked that it was much later than they thought. Indeed, The Coconut Club had cast its spell – with great reluctance, we left our island paradise and returned to the urban jungle of Los Angeles. A night at The Coconut Club evokes the heyday of Stephen Crane and The Luau, when Polynesia met Tinseltown in a spectacular tropical setting that included waterfalls, fish tanks and giant “man-eating clams.” The Coconut Club’s retro vibe recalls a time when dinners were long and luxurious, people dressed up to go out, and theatrical entertainment was an integral part of the meal. Planning is underway for the next series, currently scheduled for April-May 2015. For more info and event announcements, on-sales and updates, readers can sign up for The Coconut Club mailing list at TheCoconutClubLA.com.